Always wanted to be a citizen of Fire Nation? Here’s one way to ace the citizenship exam: punch-activated flaming kung fu gauntlets of doom. As with all the many, many, many flamethrower projects we’ve featured before, we’ve got to say this is just as bad an idea as they are and that you should not build any of them. That said, [Sufficiently Advanced]’s wrist-mounted, dual-wielding flamethrowers are pretty cool. Fueled by butane and containing enough of the right parts for even a minimally talented prosecutor to make federal bomb-making charges stick, the gauntlets each have an Arduino and accelerometer to analyze your punches. Wimpy punch, no flame — only awesome kung fu moves are rewarded with a puff of butane ignited by an arc lighter. The video below shows a few close calls that should scare off the hairy-knuckled among us; adding a simple metal heat shield might help mitigate potential singeing. Firebending gloves not enough to satisfy your inner pyromaniac? We understand completely. [JLaservideo] has created some cool high-voltage gloves and uploaded a video on YouTube showing you how to get your mitts on a pair of your own. Using some very simple parts, he manages to make some decent sparks. At the heart of this project is one of those new-fangled arc lighters which normally use some type of voltage multiplier circuit to function. The rest of the build is just wire, glue, aluminum foil, a switch, and paintball gloves. Using the tip of each finger as an electrode, anything he touches will complete the circuit, creating high-voltage arcs. The demo of burning through paper is pretty neat, although we’ll admit we’re at a loss to think of what other tricks you could pull off with electrified fingertips. Anyone? We’ve all been guilty of buying things we want, but don’t need. And that’s how [PodeCoet] found himself in possession of a couple of double-arc electric lighters, thanks to those far-eastern websites purveying cheap goods. ‘Tis the season of giving after all, justified [PodeCoet]. Being a hacker, the obvious thing to do was to make them belt out tinny tunes. If you’re still holding on to your gas lighters, don’t — because these electric ones are ‘oh so hackable’. Dual-arcs are the same, but twice the fun. 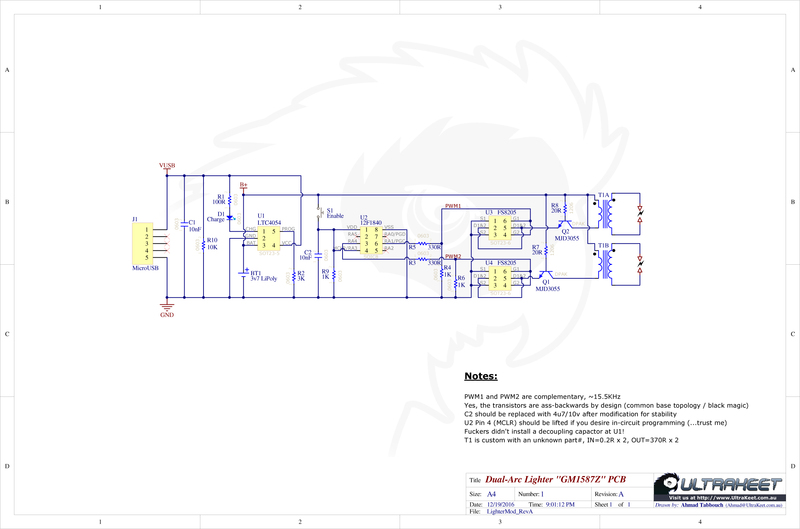 [PodeCoet] starts off with a tear down of the lighter, to figure out the schematic and understand how it works. There’s a charger IC for the LiPo, an unidentifiable micro-controller, a pair of FET’s driving a pair of power transistors, which in turn drive the HF output transformer at around 15.6kHz. He guesses that the “original micro-controller is probably an OTP part like a 12C508” but in the absence of a chipID he couldn’t be sure. Instead of trying to break his head over it, he just swapped in a pin-compatible PIC12F1840. All that’s left to do is to write some quick-n-dirty code and sprinkle it with funny comments in order to modulate the output signal at audio frequencies. His first choice of tune was “We are Number One” by Lazy Town, the Icelandic educational musical comedy children’s television series (phew). But redditors are awesome, and someone asked him to add the “Imperial March” and [PodeCoet] obliged. Since he was going to gift these lighters, the sneaky hacker added a prank in the code. Every time the button is pressed for more than two seconds, it works as normally expected and a counter is incremented. On the 20th count, and for one time only, the tune is played. No amount of pressing the button will play the tune again, confounding the user to wonder if he was hallucinating. This also helps ensure the lighter does not self-destruct prematurely, since the output transformer is likely designed for low duty cycles. His blog post contains all of the information needed to do this hack along with handy tips to avoid the problems he faced. A “Happy Birthday” tune would be great when lighting some birthday candles, we think. [PodeCoet] has a fancy for high voltage stuff – check out “Home built Stun Baton turns you into a cop from Demolition Man“. This man surely loves his pranks, as evidenced by “Hacking your Co-Workers Label Makers“. And the farce is strong in this one — “Student trolls anti-Arduino Prof with parasite MCU“. [GreatScott!] needs to light off fireworks with an arc rather than a flame, because “fireworks and plasma” is cooler than fireworks and no plasma. To that end, he attempted to reverse engineer an arc lighter, but an epoxy potted high-voltage assembly thwarted him. Refusing to accept defeat, he modified a CCFL inverter into an arc lighter, and the process is pretty educational. With his usual impeccable handwriting and schematic drawing skills, [GreatScott!] documents that his CCFL inverter is a resonant Royer oscillator producing a sine wave of about 37 kHz, which is then boosted to about 2400 volts. That’s pretty good, but nowhere near the 15 kilovolts needed for a self-sustaining arc across electrodes placed 5 mm apart. A little math told him that he could achieve this by rewinding the transformer’s primary with only 4 turns. After some testing, the rewound transformer was fitted back into the Royer circuit and with a few modifications the arc was struck. It’s not a finished project yet, and we’re looking forward to seeing how [GreatScott!] puts this to use. For now, we’re grateful for the lesson is Royer oscillators and rewinding transformers. But if you’d rather hack an off-the-shelf arc lighter, there’s always this arc lighter pyrography pen, or this mini plasma cutter. What do you get when you combine an arc cigarette lighter and some scrap glass and metal? [NightHawkInLight] created a simple plasma cutter project along with some hot glue and a few simple tools. If you aren’t a smoker, an arc lighter uses a high voltage spark to light the cigarette. He essentially cannibalizes it for use as a power supply. Any similar high-voltage power supply should work just as well. He also uses the same cigarette lighter power supply for an arc pen, that we covered earlier.